In Egyptian mythology, Wadjet, or the Green One, is one of the oldest Egyptian goddesses. Wadjet was revered as the goddess of childbirth and protector of children. She later became known as the protector of kings and the symbol of rulership. The word Wadj (green) means “to flourish” or “to be healthy.” The color green represented vegetation, new life and fertility. The ancient Egyptians recognized the cycle of growth and decay and so green was also associated with death and the power of resurrection. 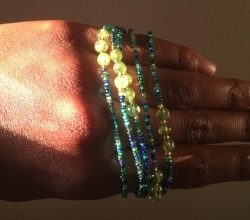 Gemstones: Peridot brings abundance and prosperity. It is capable of healing and harmonizing all interpersonal relationships, especially the marital relationship, where it can reduce stress, rage, and jealousy. Peridot helps to heal the ego. Intentions: I intend to openly celebrate processes where renewal, growth, rebirth, and rejuvenation take place, including but not limited to major life changes.